Authentic 1937 Hacienda set behind mature hedges in the coveted Chandler Estates. Former residence of the Hollywood star and icon Mae West. Original white brick masonry, classic Spanish tile, dramatic arches and loaded with warmth and "Old Hollywood" charm. Soaring wood beamed ceilings and an intimate covered back patio and private pool area great for entertaining and dinner parties. Wood burning fireplaces, incredible formal dining, tile floors, large front grassy yard and covered veranda. Surrounded by mature pine trees and palm trees this property instantly takes you back in time. 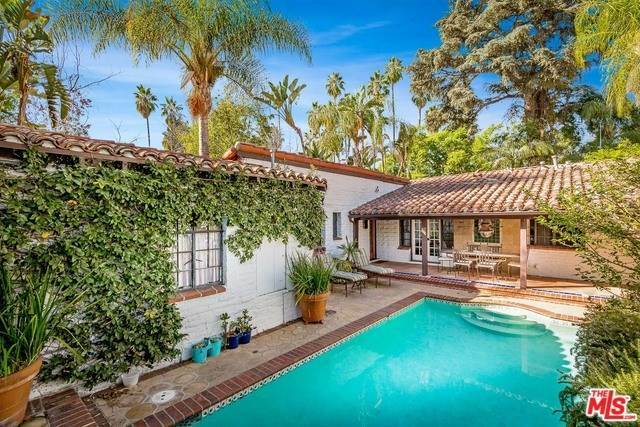 Very rarely does a timeless hacienda style home this special come to market. SchoolsClick map icons below to view information for schools near 5382 Circle Drive Sherman Oaks, CA 91401. Listing provided courtesy of Donovan Healey, Hilton & Hyland. Home for sale at 5382 Circle Drive Sherman Oaks, CA 91401. Description: The home at 5382 Circle Drive Sherman Oaks, CA 91401 with the MLS Number 18395870 is currently listed at $1,030,000 and has been on the Sherman Oaks market for 191 days. You are viewing the MLS property details of the home for sale at 5382 Circle Drive Sherman Oaks, CA 91401, which includes 3 bedrooms, 2 bathrooms and has approximately 1596 sq.ft. of living area.